he armed horsemen and nomadic people of Mongolian Huns2 came from Central Asia and had a terrible reputation. They had already invaded and subjected many peoples (Alans, Ostrogoths). Then they invaded the land of the Teutons (Germanic people: Visigoths, Vandals3, Burgundians and Suebi) who saw their only escape to be a flight over the Danube River where they were accepted into the Roman Empire. The Vandals3 who were originally pushed by the Goths into the territory between the Vistula and the Oder Rivers, moved at the beginning of the 4th Century to Gaul, where they reached the Iberian Peninsula about 409. 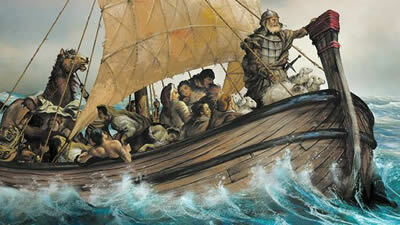 Besieged by the Visigoths they fled to North Africa where they founded their own kingdom and conquered Carthage in 439. From there they moved to Italy and sacked Rome 455, and later Corsica and Sardinia. In 533/534 they were defeated by the Byzantine Commander Belisarius. The empire of the Huns extended from the Caucasus to the Danube and the Rhine, and under Attila they invaded Gaul. Only the joint military forces of the Romans, Franks, Burgundians and Visigoths were able to defeat them in 451 (Battle of the Catalaunian Plains). After Attila's death in 453, the Hun Empire collapsed. All this was relatively short-lived: the kingdoms of the Goths and Vandals were destroyed by the Eastern Roman Empire and the Visigoths were invaded by the Arabs. Only the newly created states of the Franks, Langobards4 and Anglo-Saxons would endure and the situation in Central Europe become stabilized once again. 2 Huns = A savage Asian nomadic horse people from the highland of middle Asia, were defeated in the 1st century BC by the Chinese and therefore moved westward. 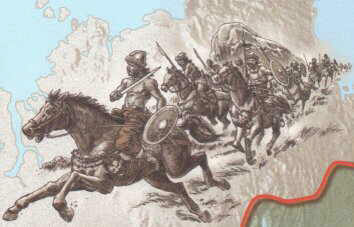 Around 370 AD, under the leadership of Balamir, they subjected the Alans, a Caucasian nomadic tribe who lived on the Terek, Kuban and the lower Don Rivers; and in 375, together with the Alans, they crossed the Don where they conquered the Ostrogoths and then pushed the Visigoths over the Danube. 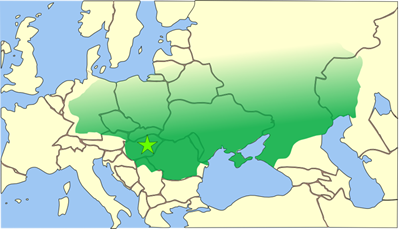 The period from 433 to 454, under the reign of Attila, was the greatest period of Hun power. During this time, they had a huge kingdom north of the Black and Caspian Seas, and the Caucasus through Hungary in the West almost to the Rhine River. They then subordinated the Eastern Roman Empire (441-443, 447) with their incursions. The Huns continued to spread fear with their raids into southern France and Rome before they were defeated by the Romans under Flavius Aetius and the Visigoths in 451 in the Battle of the Catalaunian Plains. In 452 the Huns invaded Italy and devastated many cities, before they retreated from Rome to their ancestral homeland of Pannonia (today’s eastern Austria). After the death of Attila (454), his sons Ellac, Dintzic or Dengizich and Erac engaged in a succession of battles with the oppression of more people under the Hun Empire. When Dintzic, Attila's son was killed in battle against the Goths in 468, the name of the Hun Empire disappeared. The surviving Huns were assimilated into other nations. 3 Vandals = East Germanic people, whose original settlement area is unknown, the most significant tribes were the Hasdingi and Silings (Silesia is named after the latter) and who settled in the Oder-Warta region. During the Marcomannic wars (166-180) hordes of Vandals, settled on the eastern slopes of the Carpathians and later into the fluvial basin of the Tisza. In 406-407 the Vandals crossed the Rhine River with Suevi and Alans (Caucasian nomads tribes) and in 409 they arrived in Spain, where in 411 they received land grants as Roman federates: the Hasdingi and Suevi in the area known as Galicia today, and the Silings in the area now known as Andalusia. There they were besieged by the Visigoths. About 80,000 Vandals and Alans were driven out of Gaiseric to North Africa in 429, where they founded their own kingdom on Roman soil. In 439 the Vandals took Carthage which they made their capital and in 455 the Vandals, appeared with a fleet from Rome, and plundered the city for 14 days. Their Kingdom was destroyed in 533-534 by the Byzantine Commander Flavius Belisarius. 4 Langobards ("men with long beards" also called Winniler) = Elbe Germanic tribe (part of the Suebi), who settled at the time of the birth of Christ onto the lower Elbe. After hiking and military campaigns ( today's northern and eastern Germany) they occupied areas north of Noricum by 490. Langobards were first mentioned in 488 in the Land of Rugii (Lower Austria). In 508/509 they defeated the Heruli and took over their kingdom on the Morava in today's south of Slovakia. In the 6th Century they extended their settlements to Pannonia to the Sava, destroyed the kingdom of the Gepids in 567 in today's Transylvania and in 568, under King Alboin, they broke into the then Byzantine Italy. The Langobards kingdom with its capital at Pavia encompassed northern Italy and parts of central and southern Italy. Charlemagne, king of the Frankish Empire, conquered Pavia in 774 and crowned himself king of the Langobards. In 951 the territory of the Langobards was connected by Otto I, King of East Frank Empire (Ostfrankenreich), with the Holy Roman Empire of the German Nation. The Duchies of Benevento, Capua and Salerno in the south initially remained independent, until the 11th Century when they came under Norman rule.